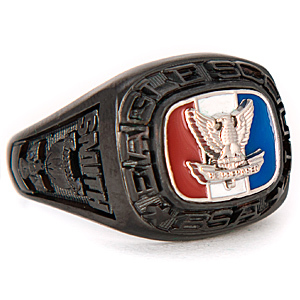 Eagle Scout honor ring is made of shadow cast metal and features a red, white and blue enamel top and a unique all black modern finish. Personalize the ring with engravings on the sides and on the inside. This ring is officially licensed by the Boy Scouts of America. Handcrafted to order. Made in the USA.